MagFly® technology is a robust and compact solution which literally gets your magnetic system up on its feet. The secret behind this technology is our patented foot & spring system which makes child’s play out of positioning magnets and/or shuttering precisely to the millimetre. In the “neutral” position there is an air gap between the steel table and the magnet. 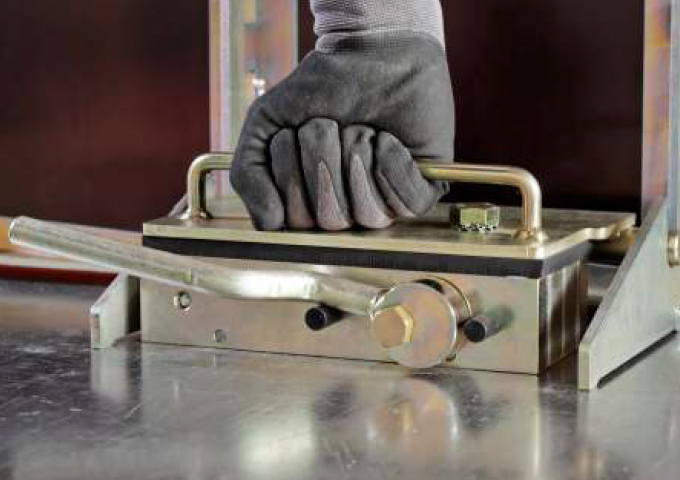 This air gap means that the full magnetic force of the magnet does not come into play straight away, allowing it to be adjusted to the desired position without clamping. It is then activated by applying slight pressure. Only then does the full magnetic force become effective, which can be more than 30,000 N per magnet. It started as an ingenious idea and turned into a success story, meanwhile becoming a standard for us: many of our magnet and shuttering solutions are now equipped with MagFly® technology as standard.